Youtube downloader is a popular tool used to download video and audio content from the internet. In this article were gonna see how to build one using .Net. Youtube downloader is a popular tool used to download video and audio content from the internet. This document is specially prepared for those developers who are interested in developing client applications which can interact with youtube over the internet. It is assumed while preparing this document that the reader is well versed with the .NET framework and the C# programming language. In this document, we will see how to develop an application using the C# programming language. This sample program will be used to download videos from YouTube. Before going anywhere, it is very much important to know the details of the YouTube Downloader.? YouTube Downloader is a software which is used to download video and audio contents from different internet websites e.g. YouTube, Facebook, Google Video, Yahoo Video, and many others. The YouTube downloader also converts these downloaded files to other video formats. The program is written in a very simple and easy manner. Also, it is very easy to execute the program. We just need to specify the URL for the video which we want to download and then hit the Ok button. We will be using the C# programming language here to develop a sample YouTube downloader application. The code used for developing this application is a very simple and easy to understand to any developer. This code can easily be integrated with their ongoing solutions or projects. Here, in this article, the third party library is not used for doing the task. The only thing that needs to be done is to take two .cs files and then finally integrate them into the project. The YouTube Data API enables us to develop applications to retrieve and update YouTube content in the form of data feeds. It works in the same way the Google Data API works. The client side application always take help of the YouTube Data API to fetch different components like video feeds, responses, comments, playlists, along with the query for different videos. This query should match a particular criterion. The data API can also be used to execute authenticated requests to update this information and to upload the new video content to the site. The client library (.NET based) is used to retrieve public feeds over the internet or even to execute the authenticated operations. All the public feeds exist in read-only mode. They do not require any authentication. On the other hand, authenticated operations, does the retrieval of private feeds along with the basic write, upload, update and delete operations. A user needs to register and get the developer key. This developer key will allow the user to execute all authenticated operations. In order to execute any operation by using the YouTube API, we need to create a YouTubeRequestSettings object. This object mentions the authentication information and also scheme which is to be used. Using this object, we then create a YouTubeRequest object. This object is used to actually perform the operations. It must be noted that if we do not specify the authentication information while creating the YouTubeRequestSettings object, then we will be allowed to use and perform operations only on those YouTubeRequest objects, which do not require authentication. Let us have a look at some sample programs mentioned below. Figure 1. Shows the snapshot of the YouTube downloader. YouTubeVideoQuality Class: This class is used for describing the video. YouTubeDownloader Class: This class is used for downloading the video. Now we have to write down the code in two (.cs) files. One file is mainForm.cs, where the main code of the first screen is written. The following code is written for that purpose. After that the second screen is written in downLoad.cs file. At the time of creating this project, user needs to open visual studio 2010 through C# project and create the following file. The following file, mainForm.cs is the first program in the project. This main class is required to design the page. This class also sets the file types that are in the application. Here we also handle some exceptional conditions which are capable enough to check if any error is occurring in the page or not. Step 1 - We first prepare the downloader which is required to download the video. Step 2 - We now have the button 1 click event. This event triggers the DLL. At this point, the DLL will give us the link of the download and also the name of the video file. The two textboxes are set to non visible (visible = false). We will need this information in the back in order to fetch the download link of the video which is to be downloaded and also to get the file name. The file name is required to put it in the save as on the savefiledialog and also in the message box which shows that the file is being downloaded. If the web request is successful, which means that the download file is found, then it starts downloading the file in chunks of bytes over a byte buffer using the memory stream. These bytes are then converted to a byte array. If the requested URL fails, which means that the download is unsuccessful since the download link was not found, then an appropriate message box is shown to the user mentioning that there was an error accessing the URL. Step 4 - Once we have our download web request ready, we then add the download button event. This starts downloading the file corresponding to the URL which is mentioned in the LinkText text box. The string ytdata is the video file title which the DLL generated earlier. Here, we have the ytdata string set as the savefiledialogs filename to save to and have it set to add the extension .flv. We can simply rename the flv file to wmv extension, the data stays the same and wmp player can play it well. Step 6 - We now have the downloaded YouTube video stored on our computer. We can view anytime we want. Format - Used to specify the video format. Location - Used to specify the geographic coordinates in terms of latitude and longitude. Number to fetch - Used to specify the maximum number of rows to be fetched. Order by - Used to get the output in a specified order. Uploaded by - Used to specify the name of the user who has uploaded the content. We can provide ratings on a scale of 1 - 5 for every content, where 5 is the best. We can add comments on the video contents. We can set flags on the contents. We can mark some of the contents as favorites which we can refer soon. 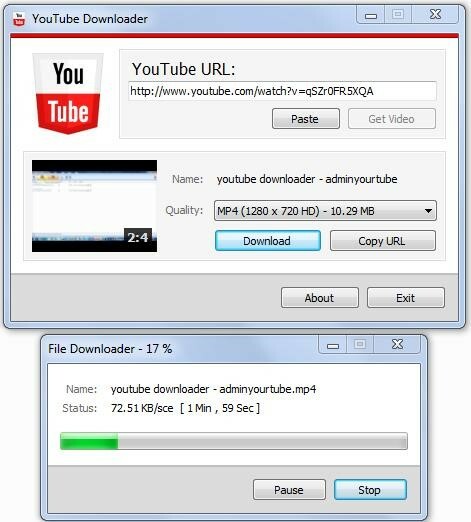 YouTube Downloader is a software which is used to download video and audio contents from different internet websites. The YouTube downloader is also used to convert these downloaded files to other video formats. The YouTube Data API allows us to develop applications to retrieve and update YouTube content in the form of data feeds. The Youtube Data API works in the same way the Google Data API works. Any operation using Youtube Data API revolves around the YouTubeRequestSettings. The Youtube data API allows us to append parameters in the query. The most commonly used parameters are - Author, Format, Location, Number to fetch, Order by, Uploaded by etc. Youtube data API comes with array of features. The most important ones are listed above. I believe now you have got an idea of what the youtube downloader is and how it operates along with its features. We can develop the client program to use the data API using other programming languages e.g. Java etc. Good reading!! There isn't DLL file, where we can download it?!!!!! !